This month, we have seen the rollout of AstraZeneca’s direct-to-pharmacy (DTP) distribution model for nine of its major products in Australia. This makes AstraZeneca the second major pharmaceutical company to adopt the DTP model in Australia, following Pfizer. The DTP model was first introduced in January 2011 when Pfizer Direct became Australia’s first exclusive distribution channel, supplying community pharmacies with around 13% of all PBS medicines. Historically, the pharmacy supply chain system for the distribution of PBS medicines in Australia consists of the traditional wholesaler model that operates under the Australian Government’s Community Service Obligation (CSO), whereby manufacturers sell their products to a number of wholesalers. Wholesalers are then required to compete to supply pharmacies across the country, and often offer discounts to attract business. The DTP model disrupts this traditional supply chain system by taking wholesalers out of the equation and appointing a logistics service provider (LSP). Operationally, the DTP model presents some challenges for pharmacies due to ordering restrictions, earlier order cut-off times and different delivery turnaround times compared with their regular wholesalers. Pharmacies, therefore, are required to be extra vigilant with their inventory management. AstraZeneca have attempted to address some concerns regarding these operational challenges by eliminating ordering restrictions and monitoring delivery performance to minimise delays. Despite attempts to appease pharmacies, many are agitated for many reasons other than just the inconvenience factor. The early cut-off times for finalising next-day delivery orders often results in having to place an order prior to receiving the goods from the previous order, as delivery times may be quite late for some pharmacies. Furthermore, patients presenting later in the afternoon with a prescription that requires product ordering will not be able to receive that product the next day. The added complexity and uncertainty can also result in greater financial risk for pharmacies, as the probability of making errors increases and many pharmacies may also be required to hold more stock as inventory. In addition to operational challenges at the pharmacy level, there are also some key points that may financially impact the Australian pharmacy industry landscape if the DTP model is not regulated closely. The DTP model has been disguised as a way for manufacturers to have greater visibility of product distribution and create efficiencies in the supply chain system. However, there are several factors that highlight the fact that the DTP model ultimately benefits manufacturers at the cost of other stakeholders. Having the ability to set a lower discount rate to pharmacies compared to previous arrangements with wholesalers. The benefits for manufacturers in adopting the DTP model are substantial, while this supply chain disruption hits other stakeholders with a greater impact — in particular, allowing manufacturers to decrease their discounts to pharmacies would affect pharmacy margins. It is certainly not difficult to recognise that discount reductions can be enforced easily for patented, branded medicines, as pharmacies have no purchasing choice in this case. Together with the ongoing price disclosures, the added pressure on pharmacies can lead to the deterioration of pharmacy viability. The sustainability of wholesalers is also jeopardised when a manufacturer withdraws its regular distribution arrangement completely, or is able to cherry-pick its most profitable items for distribution via the DTP model instead. 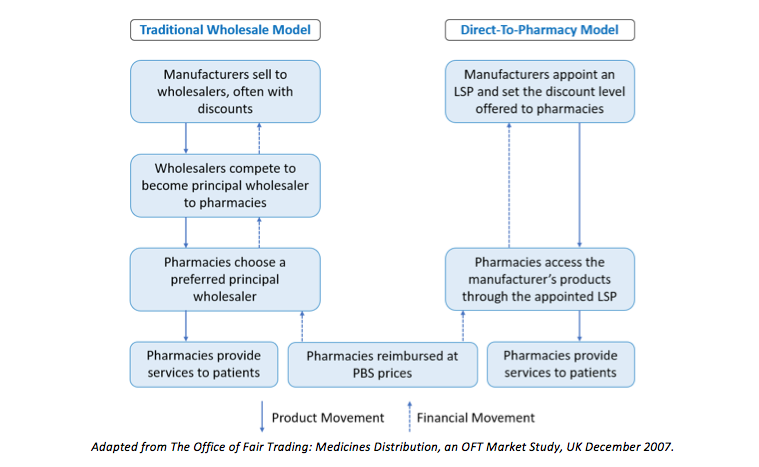 Increasingly, wholesalers can be left to pick up unprofitable items while still having to adhere to the CSO Service Standards for guaranteed supply periods, meeting thresholds for sales of PBS medicines to rural and remote locations, and maintaining reporting arrangements among many others — all of which do not apply for appointed LSPs in the DTP model. The CSO payment scheme given to wholesalers may eventually no longer be enough to sustain the damages caused by having to uphold the CSO Service Standards in an environment of diminishing economies of scale and deteriorating profitability. The traditional wholesaler model has been able to create more of a healthy competition within the supply chain system, as wholesalers are required to maintain competitive pricing in order to obtain pharmacy market share. In addition, the wholesaler model also supports the key objectives of the National Medicines Policy to ensure all Australians have timely access to medicines, through maintenance of a responsible and viable medicines industry. Commercial decisions for manufacturers to shift towards the DTP model can be understood, given the significant benefits that can be gained. However, it is clear that the traditional model for distribution via wholesalers provides greater long-term viability in the supply chain system, as well as being able to ensure quality distribution services through requirements to adhere to all CSO Service Standards. All PBS-listed medicines should therefore remain available through CSO wholesalers. The DTP model can be introduced only as an additional distribution channel rather than a substitute. With two of the major players now adopting the DTP model and the recent announcement by PharmaDispatch regarding Amgen’s decision to distribute one of its products, Prolia (denosumab) through the DTP model, it is only be a matter of when, not if, other manufacturers are going to follow suit. In this case, one can only hope that our Federal Government’s regulations will be strong enough to safeguard against the potential long-term adverse effects to the Australian pharmacy industry. Mr Kastrinakis is the CEO of Advantage Pharmacy Group.